There have been a handful of long-time band-members and collaborators whose time with Disjecta Membra stretches back further; most notably Jaz Murphy, who first started playing with us back in 1998. 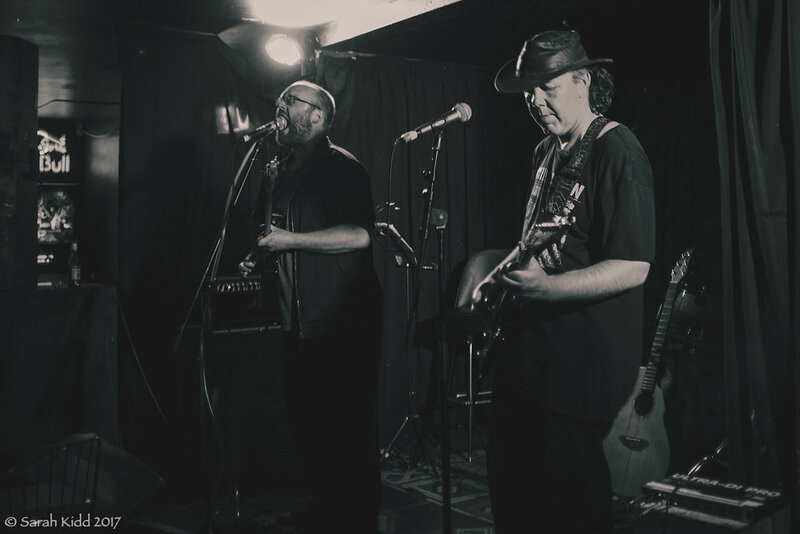 But aside from me (Michel), Kane is the first person to remain a permanent fixture in the group for a full decade, while our musical connections span a little over twenty years. Kane Francis Davey was born in Rotorua, New Zealand, on 2 April 1975, the son of Keith Davey and Christine Harrison. When he was nine years old he moved to Cambridge, a small town on the outskirts of Hamilton. As teenagers, Kane and his childhood friend Vivian Stewart started jamming together on a regular basis. While nothing substantial eventuated at the time, it marked the beginning of a musical relationship that would later permeate Kane’s own songwriting vehicles, Serenna and Manumission, as well as Disjecta Membra. But in those days, Viv was a lot more interested in metal, playing in a few garage bands with friends around Cambridge, whereas Kane was more concerned with his own songwriting efforts. Shifting in to Hamilton around 1995, both Kane and Viv moved in similar circles to Disjecta Membra – the how, when and where of our first crossing paths. They were both close friends with Scott Barnett, also from Cambridge and a fellow Floyd fan. Scott was a member of D.E.A.N. during the early-mid nineties (whom we played some of our first few gigs with), and after leaving D.E.A.N. he did a short stint on keyboard and guitar with Disjecta Membra in late ‘95. By this time Kane was listening to bands like Sonic Youth, Primus, Superette and Afghan Whigs, which in turn shaped the direction of his first real band venture, as guitarist with Hamilton five-piece Pugnaut. Active from c.1995-97, Pugnaut also shared members with Trinket (1995-2000), who likewise hailed from Cambridge and ultimately morphed into The Datsuns (2000-present); two of Kane’s bandmates would become long-time Datsuns. Pugnaut regularly gigged around Hamilton on much the same circuit as we did; we shared the stage at The Wailing Bongo at least once around early-mid 1996. During their short time together, Pugnaut self-released two EP-length cassettes, Interstellar Radium Discharge (1996) and The Intelligent Bear (1997). The first tape might be reasonably characterised as fairly unremarkable indie guitar rock, whereas the followup showed some maturity and sophistication entering their songs. ‘Theatre’, a track from the second release, I think also hinted at a slightly more interesting sense of melancholic pop. When they disbanded in 1997, Kane took an extended break from playing in bands. Vivian Stewart meanwhile moved to Wellington around 1998, where he was invited to join Disjecta Membra, although his initial tenure was to be short-lived. Kane in turn left Hamilton in the year 2000, and spent the next couple of years travelling around New Zealand, moving first to Auckland, followed by Taranaki, and then Dunedin; eventually putting down roots in Wellington in about 2002. In Wellington, Kane reconnected with Vivian, giving form to Serenna as a band in 2003. Kane led the group as songwriter, vocalist and lead guitarist, while Vivian alternated between bass and guitar, also doubling as their engineer/producer. Viv was also guitarist with Wellington death/grind outfit Slave Cadaver at the time, and brought Slave Cadaver’s drummer Jared Carson (alias Jay Rodeo) into the new group with him, while violinist Polina Outkina completed the original quartet. Initially named Woebegone, they became known as Serenna from 2004. The band fused dark folk, classical and post-rock elements, and Kane cited Disjecta Membra as one of their influences. Serenna’s live performances gained notice for their distinctive combination of these stylistic leanings, and for their visually striking stage presence. Members performed seated, evocative of a classical or early music consort, and often employed simple but effective stage props like candelabra, or performing in silhouette from behind veils or screens drawn across the stage. As Serenna became more active, Vivian left Slave Cadaver in 2005, whereas Jared continued drumming for both bands. Polina meanwhile left Serenna, with the role of a live string player being filled soon afterwards by cellist Jane Pierard, also previously from Hamilton. In February 2005, Wellington promoter Craig Charles of Creepshow Productions and I arranged for Hamilton glam/trash/rock band Rose Petals and Confetti (RPAC) to play a Wellington gig for Craig’s birthday, on a bill that also featured Serenna and several others at Bodega: memorable also as Saliva Twist’s high-spirited final show. I’d come down with RPAC and stuck around Wellington for a while, where I caught Serenna’s next show at Valve (now Valhalla), less than a week later. Both performances were thoroughly and immediately engaging. Kane and I in turn struck up regular communication; before that, we really only knew of each other through Scott and Viv. It was also about this time that Jason Just (ex Burnt Weeping Eyes, Lightslastfading and Shemsu Hor) told me that he was working on a new project, Distorture, and asked if I could recommend a suitable vocalist. Serenna at the Hell Bound Ball, The Studio, Auckland, 29 October 2005 (L-R): Vivian Stewart, Kane Davey, Jane Pierard (unseen: Jared Carson). Photo: Shaleen Chandra, Club Bizarre. Kane’s collaboration with Jason in Distorture also coincided with his growing interest in the music of Der Blutharsch, Sonne Hagal, Dead Can Dance, Darkwood, Ordo Rosarius Equilibrio, Death in June and Rome. 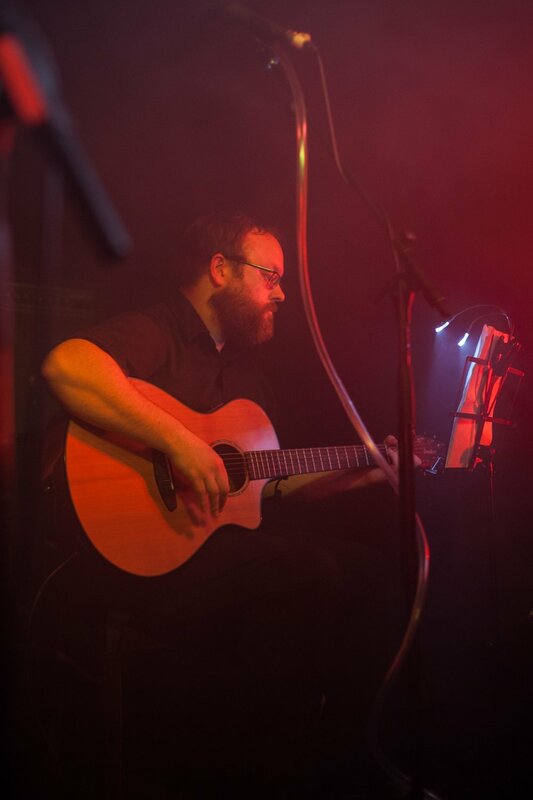 As well as being a strong point of mutual interest between Kane and Jason, dark ‘neofolk’ and related styles in turn had a growing impact on Serenna’s direction, and remain influential on Kane’s current approach to folk music. He has developed a particular interest in artists termed ‘neofolk’ but who are “pretty much left anarchistic leaning”, moving in the opposite direction to perceptions of “neofolk as neofascism in song form”. To those ends, he cites the work of Rome, Ordo Rosarius Equilibrio and Spiritual Front as being especially relevant. In 2006, Serenna recorded and released Kin; a CD single comprising the title track and ‘Aphotic’. A cellist being a rare commodity in Wellington’s alternative music scene, Jane Pierard was in demand and unavailable for the sessions, being engaged at the time with The Moon Whispers (who also featured drummer Dan Smart, later to join Disjecta Membra in 2008). For the recording of Kin, Kane, Vivian and Jared were joined by cellist Brenton Veitch, who had trained at the Royal Academy of Music in London, and whose credits included the Auckland Philharmonia, Orchestra Wellington and the New Zealand Symphony Orchestra. In 2007, Jason and Kane released Distorture’s début CD Revere, through Jason’s Symbolique Studios imprint. On 23 June 2007, the launch show for Revere was held at Wellington’s Subnine, taking the form of a joint performance with Disjecta Membra. The performance concept was initiated by Jason, whereby both groups were to play alternating sets side-by-side on stage; Distorture would play a song, then Disjecta Membra, followed by Distorture, and so on. I also sang with Kane for two tracks in Distorture’s set, while both Kane and Jason made appearances on guitar as part of a revolving Disjecta Membra line-up of up to ten live members, including Viv from Serenna on bass and guitar. This was Kane’s first performance with Disjecta Membra, following which both he and Viv became regular members of the group. One key area where Kane had immediate and lasting impact on Disjecta Membra’s music was in affixing his own signature to songs like ‘Gael’, ‘The Infancy Gospels’ and ‘Cernunnos’; his natural instincts as a guitar player being especially well attuned to the blues, folk, western and garage rock influences underscoring them. Earlier incarnations of the group had demoed and played these songs live before, most notably with Stan Jagger on lead guitar from 2005-07. At first then, Kane was effectively stepping into Stan’s shoes for this material, but wasted little time expanding on that role so that the songs and his own part in them became inextricable. Kane Davey, Disjecta Membra at Deathpunkfest, The Basement Bar, New Plymouth, 31 May 2008. Meanwhile in Serenna, both Jane Pierard and long-time drummer Jared Carson left the group between 2007 and 2008. One notable document of Pierard's tenure with Serenna was the unreleased track ‘Progenitor and Presentment’, recorded c. 2007, also featuring Kane’s old bandmate Ben Cole (Pugnaut, The Datsuns et al) on drums. Harking back to a disquieting impression from Kane’s teens, the song recalled the last time he had seen his great grandmother, Rose, shortly before she died. With Kane and Viv now the only constant members of Serenna, Vivian turned his hand to programming percussion and strings for accompaniment. Both for recorded work and live performances, from 2008-09 the project involved contributions from Jason Just (acoustic guitar, percussion) and vocalist Plum Green, whose solo recordings were being engineered by Vivian at the time. Isobel (Izzy) Te Aho-White from Nullity and Disjecta Membra (who’d likewise made her live début with us at the Subnine show) also appeared briefly as Serenna’s live bassist, and around the same time original violinist Polina Outkina rejoined the group. Disjecta Membra/Serenna gig poster, April 2009. Design: Jason Just. Serenna, Hole in the Wall, Wellington, 4 April 2009. Front (L-R): Kane Davey, Plum Green, Polina Outkina. Back: Vivian Stewart, Izzy Te Aho-White. Over the course of 2009, Serenna gradually became known as Manumission, reflecting the project’s metamorphosis. Kane’s songwriting moved further in the direction of martial neofolk, drawing from the unique military history and traditional folk music influences of New Zealand. Within a few months’ time, however, Vivian Stewart had left both Disjecta Membra and Manumission, bringing an end to the latter project for the foreseeable future. Notwithstanding, some excellent recordings from this period exist, which we can only hope will eventually see official release. Outwardly, so far as releases and public performances were concerned, 2010-13 was a quiet period for the various projects Kane had been involved with. Following Manumission’s dissolution, and with Disjecta Membra also temporarily inactive, Kane and Jason Just returned their attentions to Distorture. Kane had recently started a family, so that finding time for multiple bands and recording projects became less of an immediate priority. Notwithstanding, he remained unequivocal in his commitment to Disjecta Membra for the long-term, while Jason Just contributed acoustic guitar work to (as-yet-unreleased) Disjecta Membra recordings from this period as well. Recorded versions of two Distorture songs with both Kane and I sharing vocals have likewise languished unreleased in the vaults of Symbolique Studios since 2007. In late 2013, Disjecta Membra was revived as a live band by the opportunity to join Peter Murphy (Bauhaus) as special guests on the New Zealand leg of his ‘Mr Moonlight’ world tour. Around the same time, Distorture became a long-distance collaboration between Kane and Jason, when the latter relocated to Washington D.C., meaning that Disjecta Membra benefited from becoming Kane’s focal project. What probably hasn’t been noted before now, is that Kane’s contribution to the EP’s most popular track, ‘Madeleine! Madelaine!’ was also pivotal. The song when first presented to the band in demo form had no guitar parts; Kane’s gliding, propulsive rhythm guitar-octaves, coupled with Bryan Tabuteau’s definitive synth production, were key to elevating ‘Madeleine’ from the stature of a fairly lightweight, wistful little pop song to assume the comparatively robust and dramatic stance that it holds now. Matthew and Izzy’s departure from the group in November 2015 (a full year before The Infancy Gospels’ eventual release) stripped the band down to a trio, with long-time collaborator Jason (Jaz) Murphy rejoining the group as fulltime bassist just a few days later. But Matthew, with his idiosyncratic, textural approach to guitar and synths, had carved out his own inimitable niche in the group, so that finding a suitable ‘replacement’ was never realistically on the table. Two happy consequences of that space remaining vacant, however, were that it cleared a path for Kane to draw from a broader sonic palette, and for the two of us to work more closely together. Ultimately, the streamlined three-piece consolidated into a tighter, more efficient unit, enabling both Kane and Jaz’s musicianship to come to the fore. The dates with Ikon and Sounds Like Winter were accompanied by the split-CD release Songs to Scattered Symbols, which included our own reworkings of the Ikon song ‘Subversion’ and Boney M.’s Euro-disco hit, ‘Rasputin’. Kane’s substitution of the lead synth melodies from ‘Subversion’ with a slide guitar set the languid pace for our take on the track, while ‘Rasputin’ took more of a rock-driven approach; both guitarists trading back and forth between lead and rhythm. Other new material to emerge over the intervening period included ‘Far from the Chant of a Murmuring Sun’, débuted at the reconfigured trio’s first live outing in July 2016; and ‘For the Calling Out of Names’, introduced during The Mission support dates and traversing similar ‘folk rock’ terrain to ‘Cernunnos’. ‘Far from the Chant…’ immediately set the precedent for strong collaborative input between all three members. Jaz’s bass performance straddles a stylistic range comparable in places to Steve Harris, elsewhere Roger Waters or Tony Pettitt, while Kane’s guitars run the gamut of treated atmospheres, elegant lead passages, understated arpeggios and more forceful rhythms. Unabashedly ‘epic’ in its scale, a heavily abridged version of the song road-tested for the Ikon shows clocked in a little under the eleven-minute mark. ‘For the Calling Out of Names’ meanwhile finds Kane on acoustic guitar, delivering a mixture of intricate, arpeggiated passages and more folk-ish, swaying rhythms. Kane with Disjecta Membra, Bodega, Wellington, 18 November 2017 (supporting The Mission). Photo: Stella Gardiner, Undertheradar. The Powerstation, Auckland, 19 November 2017 (supporting The Mission). Photo: Dave Simpson, Undertheradar. The Powerstation, Auckland, 19 November 2017. Photo: Warren Jones, Invisimages. The earlier part of 2017 has been spent exploring folk and acoustic territories further, with a stripped back live-to-air on Wellington’s Radio Active FM in February, and an intimate performance for the family and friends of Kane’s wife Catherine on her 40th birthday in April. The on-air performance was shaky at best, being thrown together at short notice, but provided a useful catalyst for developing more fully realised acoustic material. Several songs from The Infancy Gospels were reworked in this vein, while new additions to the April set included Bowie’s ‘The Supermen’, and a new song led by Kane, titled ‘The New Folk’. Based on a concept he’d initially floated some years earlier, ‘The New Folk’ considers the New Zealand Land Wars of the 1860s from the perspectives of two fictionalised characters; one a recent arrival with the 2nd Battalion of the 18th (Royal Irish) Regiment of Foot, and the other a ‘half-caste’ Māori-Irish toa rangatira in the resistance against the Crown’s invasion of Waikato. Would they take so long as us to tame?